Commentators have always regarded Giorgione’s Castelfranco Altarpiece as a unique and original work of art. It is Giorgione’s only known altarpiece, and although he used a traditional subject, he characteristically brought it to a new level. The story of the altarpiece was told best by Salvatore Settis in an extremely well researched essay that appeared in the catalog for the 2004 Giorgione exhibition, jointly sponsored by the Accademia in Venice and the Kunsthistorisches Museum in Vienna. For obvious reasons the Altarpiece was not included in the exhibition, but the essay by Settis was one of the highlights of the catalog. I have reviewed the Settis article previously and would just note here that Settis argued that the donor’s connection to Sicily helped to establish the identity of the armored saint. It’s neither St. George nor St. Liberalis, the patron saint of the Cathedral, but St. Nicasius, a popular Sicilian saint holding the banner of the Order of Jerusalem. In his essay Settis reproduced a journalist’s description of the painting from 1803 that I copy here as a model for seeing and understanding. The first thing I noticed was the relatively small size of this extraordinarily beautiful painting that had been so carefully cleaned and restored in Venice only a few years before. It would certainly be dwarfed by Giovanni Bellini’s famed Venetian altarpiece in the church of S. Zaccaria that was completed in 1505. 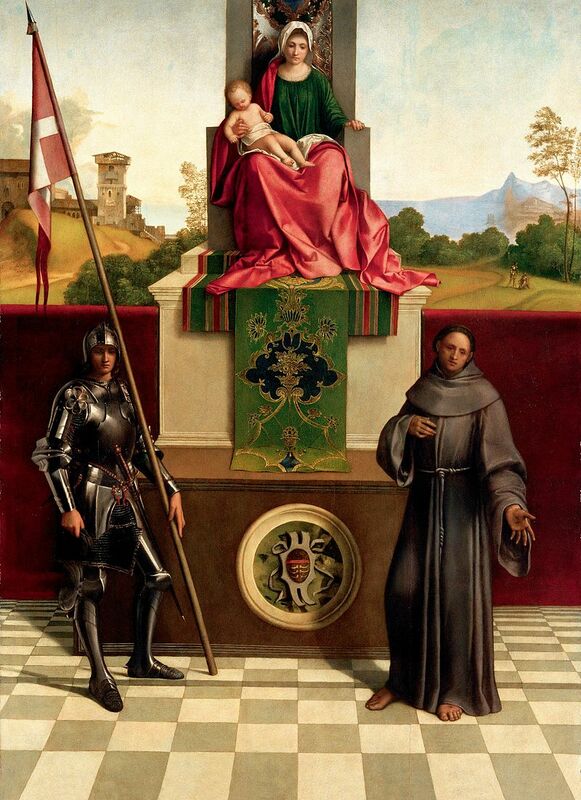 The small size of the “Castelfranco Altarpiece” stems from the fact that it was meant not for the high altar in a Cathedral but for a small funerary chapel. But why two altars? On occasion a funerary chapel is opened for Mass. At the height of the Mass, immediately after the consecration, the priest utters an ancient formula: “Lord, let your angel take this sacrifice to your Altar in Heaven.” At every Mass the sacrifice offered at the earthly altar would be merged with the eternal sacrifice of the Heavenly Altar. 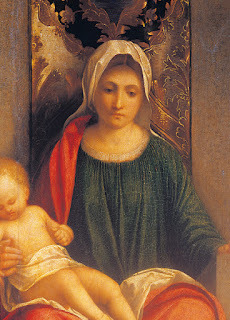 In Giorgione’s painting we see the Heavenly Altar (Mary) right on top of the earthly altar. *Enrico Maria dal Pozzolo: Giorgione, Milan, 2009, 167. 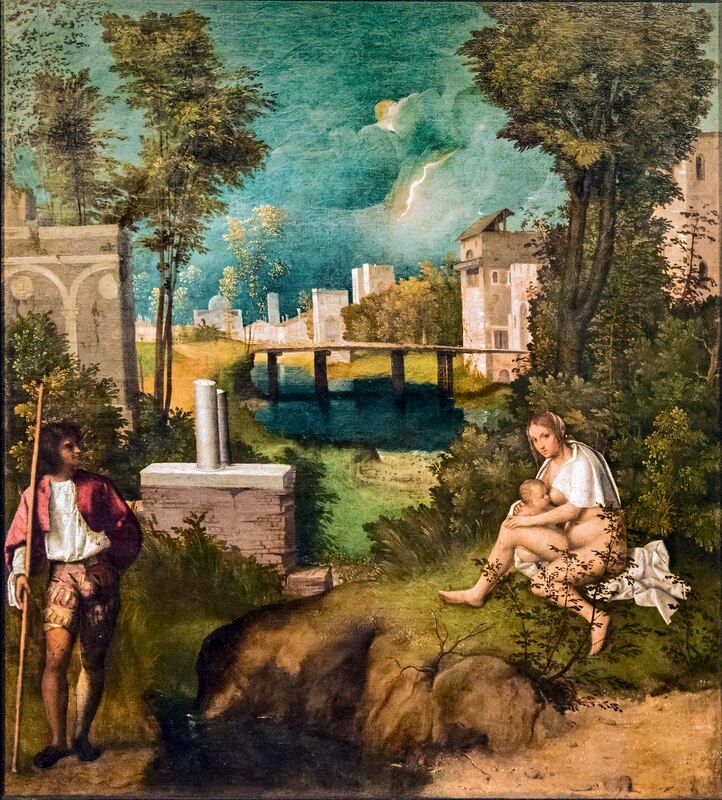 **Salvatore Settis: “Giorgione in Sicily–On the Dating and Composition of the Castelfranco Altarpiece.” In Ferino-Pagden, Sylvia, and Nepi-Scire, Giovanna: exh. Cat. Giorgione, Myth and Enigma, Vienna, 2004, 144.